I'm always searching for new ideas on how to re-use t-shirts. With two growing children, it seems there's always an endless source of t-shirts piling up in my craft room. Which has me asking, do I make something or do I donate the shirts? Usually donate wins. 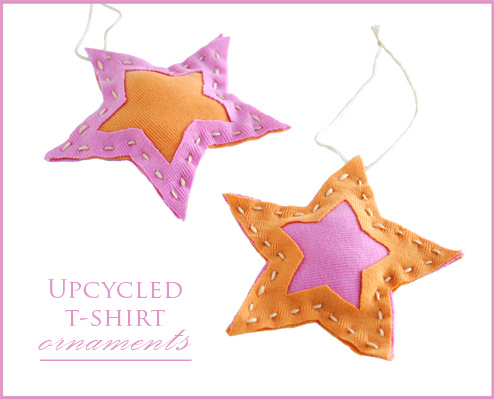 But this time around I decided to make something, upcycled t-shirt ornaments. 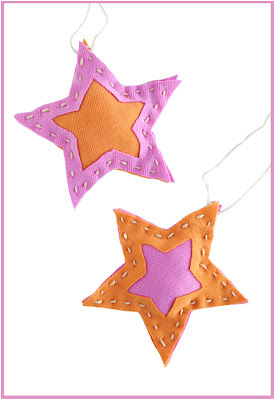 These star ornaments are fun, bright, and simple to make. So simple in fact that a child could make them (age 7 and up). 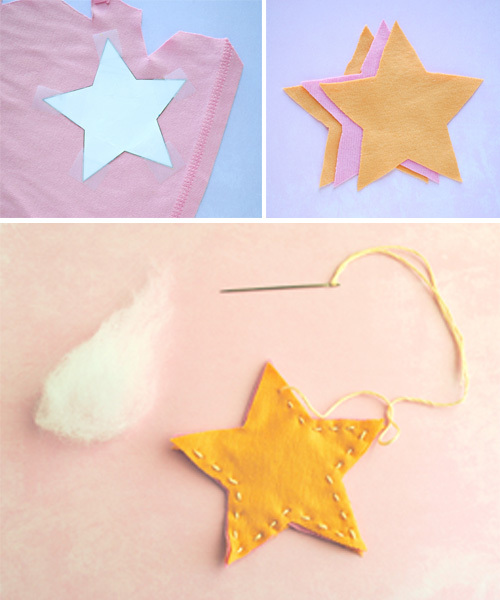 Download the star template here and cut out. I'm trying something new and using Google Documents. Please let me know if you prefer this over having to copy and paste the image. I think it will be easier for everyone. 1. Place template on t-shirt and cut out three stars. I recommend taping the star down opposed to tracing or pinning. Do what is easier for you. 2. Layer your three stars directly on top of each other (orange, pink, orange). 3. With embroider thread, sew through all three layers using a running stitch. Leave a small opening. Stuff with a little polyfill between the two bottom layers. Make sure not to over stuff or your top layer will not lay flat when finished. 4. Finish stitching all the way around and knot closed. Add a loop of embroidery thread for hanging. 5. Carefully pull up the center of your top layer and make a small cut in it. Make sure not to cut any of the other layers. 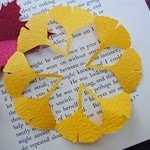 Now cut a star shape out of the top layer from the cut you just made (refer to picture on right). You could make these ornaments in any shape you want such as hearts or birds. I recommend keeping the shapes simple for best results. Have fun! Those are incredibly sweet, I love the folk art look to them. Dryer lint!?! That is so smart! I bet those would be really cute with a fussy cut window around a favorite design or character from a t-shirt. Don't use dryer lint... It's highly flammable. Unless you're making fire starters. Thanks for letting us know. I've seen it used in other crafts and never gave much thought to it. I'll take it off the supply list. I was thinking the same thing! I have a rhinestone Hello Kitty shirt tucked away for that very thing. This is such a great idea. 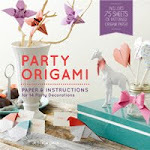 I love doing projects with supplies I've reused. Thanks for posting. 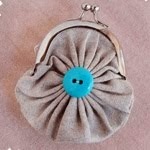 it is very clever to cut the middle after sewing the side.